Mustafa Ali: Meet the Top EPA Environmental Justice Official Who Quit to Protest Pruitt & Trump | Democracy Now! senior vice president of the Hip Hop Caucus. He resigned as head of the environmental justice program at the Environmental Protection Agency last week. 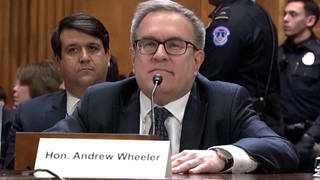 A top official at the Environmental Protection Agency has resigned in protest of a Trump administration proposal to scale back severely the size and work of the agency. Mustafa Ali helped launch the EPA’s Office of Environmental Justice in 1992 and served under both Republican and Democratic administrations. Up until last week he headed the environmental justice department. He joins us in one of his first interviews since leaving the EPA. AMY GOODMAN: The Environmental Protection Agency has been overwhelmed by angry calls in recent days after the agency’s new head, Scott Pruitt, said carbon dioxide emissions are not a major contributor to global warming. Pruitt, the former attorney general of Oklahoma, made the comment during an interview with CNBC host Joe Kernen. JOE KERNEN: Do you believe that it’s been proven that CO2 is the primary control knob for climate? Do you believe that? SCOTT PRUITT: No, I––No, I think that measuring with precision human activity on the climate is something very challenging to do, and there’s tremendous disagreement about the degree of impact. So, no, I would not agree that it’s a primary contributor to the global warming that we see. SCOTT PRUITT: But we don’t know that yet, as far as—we need to continue debate and continue the review and the analysis. AMY GOODMAN: That was Scott Pruitt, the head of the EPA, speaking with CNBC host Joe Kernen. Well, Pruitt’s comment defies scientific consensus about the laws of physics. The EPA’s own website, even in the time of Trump, features a fact sheet declaring, “Greenhouse gases act like a blanket around Earth, trapping energy in the atmosphere and causing it to warm,” unquote. Well, on Friday, one day after Pruitt made the comment, the National Oceanic and Atmospheric Administration, NOAA, revealed that the level of carbon dioxide in the atmosphere had risen at a record pace for a second year in row. Meanwhile, President Trump is proposing to cut 25 percent from the EPA’s budget and eliminate 3,000 jobs. Trump’s plan calls for the complete elimination of EPA programs on climate change, toxic waste cleanup, environmental justice and funding for Native Alaskan villages. It would slash funding to states for clean air and water programs by 30 percent. Well, we now turn to a longtime EPA staffer who resigned last week to protest the agency’s new direction. Mustafa Ali is the former head of the EPA’s environmental justice program, which worked with low-income and marginalized communities dealing with industrial pollution and climate change. Ali helped found the office 24 years ago under President George H.W. Bush. He’s now working with the Hip Hop Caucus. Mustafa Ali, welcome to Democracy Now! Can you talk about why you resigned? MUSTAFA ALI: Oh, yes, and thank you for having me. There were a number of reasons for resigning. One of them was that I felt that the values and priorities of our new administration did not line up with mine in relationship to our vulnerable communities and the work that needed to happen in that space. Secondly, I also had some great concerns about the rolling back of the budgets and the eliminating of offices that have played a significant role in helping to move those vulnerable communities forward. And then, thirdly, when I took a look at some of the proposals for rolling back regulations that have played a significant role in helping to protect the environment and public health of our most vulnerable communities, I just couldn’t be a part of that. Those regulations, many of those communities have been working for decades trying to make sure, one, that they’re in place, two, that they are more inclusive of protections for their communities and getting traction, being able to move forward. AMY GOODMAN: The Trump administration has proposed zeroing out the budget of your office, the environmental justice program. Now, this hasn’t been approved, but this is the proposal. What exactly, concretely, would that mean? Talk about some of the areas in the country that you’ve been working on and just what the words and the movement “environmental justice” is. MUSTAFA ALI: Yes, well, you have to kind of go back in history just a bit to understand environmental justice. The Office of Environmental Justice, which became, first, the Office of Environmental Equity, actually got created because of a set of recommendations that came from stakeholders. Those stakeholders were from grassroots organization. They were from academics. They were from faith-based institutions. And it actually started under William Reilly back in 1992. And the issues are numerous around the country. You could look at some of the things that are happening in Port Arthur, Texas, where there are a number of refineries, and the community is literally surrounded. Or you can look in Mossville, Louisiana, where communities have been impacted by toxic chemicals that have created some great public health challenges in those communities. AMY GOODMAN: And these communities you’re talking about are African-American communities? MUSTAFA ALI: These are communities of color, African-American communities, Latino communities, Asian-American and Pacific Islander communities, Native American communities and low-income white communities. AMY GOODMAN: Let me turn to Scott Pruitt’s recent speech to staff at the EPA when he first came in. SCOTT PRUITT: I believe that we, as an agency, and we, as a nation, can be both pro-energy and jobs and pro-environment, that we don’t have to choose between the two. I think our nation has done better than any nation in the world at making sure that we do the job of protecting our natural resources and protecting our environment, while also respecting the economic growth and jobs our nation seeks to have. AMY GOODMAN: Mustafa Ali, your response to, well, the man who was your boss, but you have since resigned, Scott Pruitt? MUSTAFA ALI: Yes, I believe that we have to be as equally focused on the impacts that are happening inside of those communities. I personally think that when we are taking a look at regulations, we could ask a basic question: If we’re thinking about creating a new regulation, will it be beneficial to our most vulnerable communities? If we’re thinking about rolling back a regulation, will that be helpful to those most vulnerable communities, or will it move them in a negative direction? And if that is the case, then I think that we are making a mistake, that there needs to be a better analysis, that there needs to be conversations that are happening with those most vulnerable communities and getting their input as we move forward. I’m often wondering: What are the criteria that you’re using to make some of the decisions, of some of the proposals that I have seen being moved forward over the last few weeks? AMY GOODMAN: Can you talk about some examples? You were recently in Flint, well known for the—what happened to the water supply of Flint, the poisoning of an American city, when it was taken off its traditional water supply by an emergency manager, who the Republican governor of Michigan had put in to rule that city. An unelected official took it off its traditional water supply of over half a century, the Detroit water system, and made the water supply the Flint River, which all knew was a corrosive, polluted body of water. Talk about the significance of the cutting of the EPA for communities like Flint, and then talk about South Carolina. MUSTAFA ALI: Oh, sure. So, as it relates to Flint, you know, that is a situation that has just devastated the community, but there is still hope also in the community. So, recently there with the mayor and some of her staff and others, focusing on some environmental justice opportunities and how we can help to revitalize that community, you know, and speaking with many of the folks who are there. You know, they are still struggling to make sure that they have fresh water, clean water, something that many of us just take for granted every day. But there are also—I want to address the disinvestments that have happened over the years inside of the community, to be able to move forward, to create a healthier and safer place. So we’re very, very focused on being supportive there. And, you know, the flip side of that is an example like Spartanburg, South Carolina, and why also I think it’s so important for the new administration to value the grant programs that exist in the agency that help communities to be able to move from surviving to thriving, as I often will frame it. In Spartanburg, South Carolina, they had a number of the issues that many of our communities have across the country. They had bad transportation routes. They had old housing. Some folks call it shotgun housing. They had lack of access to public health, to healthcare facilities. They had the environmental impacts of Superfund and brownfield sites and a number of other issues. They took that $25,000 small grant, began a visioning process with the community and asked, “What are some of the things that you would like to see fixed in our community, but also what are some of the opportunities, some of the benefits, that you’d like to see happen?” Took that $20,000 grant and leveraged it into over $300 million in changes. So now in that community you now have new healthcare centers that are there, where, before, seniors had to travel great distances to be able to get to healthcare. You have new transportation routes that are in the community, that are much more healthier and less impactful on the community. You have a number of new housing units, over 500 new homes that are there, green homes that are energy-efficient. Now, before, in the summertime, folks were spending $300 to $400 on their energy costs. Because of this new housing, they’ve been able to lower it to $67 a month, which gives a lot more disposable income, especially to those who are on fixed incomes. And as this revitalization was happening, which was community-driven, they made sure that there were worker training programs in place, so that the community members, one, were able to create their own jobs to be able to be—play a significant role and to bring hope back to this community. And there are a number of other things that are very, very positive that are happening. But these are the examples of what can happen when we value communities, when we listen to the voice of communities, and we begin to move forward in a collaborative way. They have now been able to bring the state and the local government into this process. A number of the community members, of course, are a part of the process. Business and industry is a part of the process. And as they cleaned up the brownfields and Superfund sites were being cleaned up, they now are moving forward, having a solar farm put into those cleaned-up areas, which will now zero out those electricity bills, and the excess, that can be sold to the grid, will then come back to the communities. So that’s what I talk about when I’m talking about environmental justice, addressing those past and present impacts and creating opportunities. AMY GOODMAN: So, in our last minute, Mustafa Ali, you have worked for Republican and Democratic administrations. I mean, your office was founded under President George H.W. Bush. Why leave now? MUSTAFA ALI: I felt that it was time for me to take my skills and talents to a place where I knew that they would be valued. But I also felt that it was necessary for me to stand up and share respectfully, in the letter of my resignation, with the administrator the challenges that still exist for vulnerable communities, but also the opportunities that exist, and implore him to do a serious analysis of that and to give consideration into making sure that these communities are protected and engaged in the process. AMY GOODMAN: Did Scott Pruitt respond your resignation letter? MUSTAFA ALI: I have not heard from him to date, but I do wish him well. AMY GOODMAN: Mustafa Ali resigned as head of the environmental justice program at the Environmental Protection Agency last week. He is now senior vice president of the Hip Hop Caucus.